Rules from United States Code Annotated, including the Federal Rules of Bankruptcy Procedure, the Federal Rules of Appellate Procedure, the Federal Rules of Civil Procedure, the Federal Rules of Criminal Procedure, the Federal Rules of Evidence, and additional rules. Streamlined, cloud-based solution to help draft a variety of documents. Students and faculty can update documents with KeyCite flags, hyperlink citations, ensure proper citation formatting, and build a table of authorities. This user guide describes how to use Drafting Assistant and includes instructions on how to use Flags & Links, WestCheck, Cite Formatting, Templates and Sample Documents, and TOA Builder. Allows you to automatically cite check and quote check your brief. This work first appeared in 1993. 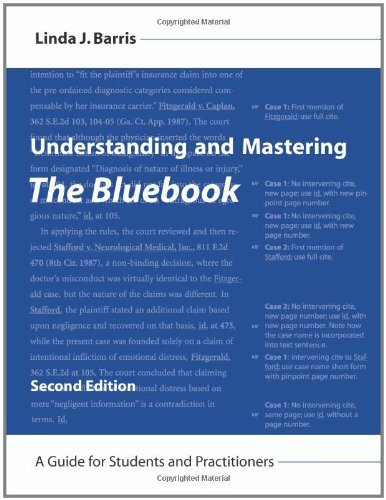 It was most recently revised in the fall of 2011 to take account of changes in the citation rules of a number of U.S. jurisdictions, having been revised the year before to reflect the appearance of the fourth edition of the ALWD Citation Manual and the nineteenth edition of The Bluebook, both published in 2010. Legal writing citation in a nutshell by Teply, Larry L.